WASHINGTON (NYTIMES) - A perfect mix of meteorological conditions has conspired over the past week to make Hurricane Irma unusually large and powerful, scientists said. "You need just the right ingredients for a hurricane of this magnitude to last for so long," said atmospheric scientist Phil Klotzbach from Colorado State University. "And Irma has had them all." Weather forecasters have already expected this summer to be an active hurricane season in the Atlantic Ocean because of warmer-than-average ocean surface temperatures, which provide fuel for hurricanes, as well as weaker-than-average wind shear, which can help to dissipate storms. Irma initially developed near Cape Verde off Africa's coast on Aug 30, and a ridge of high pressure kept the storm from wandering off harmlessly into the cooler northern ocean. Instead, it was pushed inexorably westward, with plenty of time to intensify over the warm Atlantic waters. On its journey west, it underwent at least six cycles called "eyewall replacement," when the eye of the hurricane naturally contracts. While storms can weaken during this process, they can also quickly intensify and expand in size once the cycle is complete. This is what happened to Irma - it just grew and grew. Ultimately, Irma persisted for three consecutive days in the Atlantic Ocean as a Category 5 storm, a record since scientists have been using satellites to watch storms. It also had maximum sustained winds recorded at almost 300kmh for 37 straight hours - beating the record set by Super Typhoon Haiyan in the Pacific in 2013, according to scientist Klotzbach. While Irma passed over and devastated several Caribbean islands, including the Virgin islands and St. Martin, those land masses were not large enough to make it lose momentum. 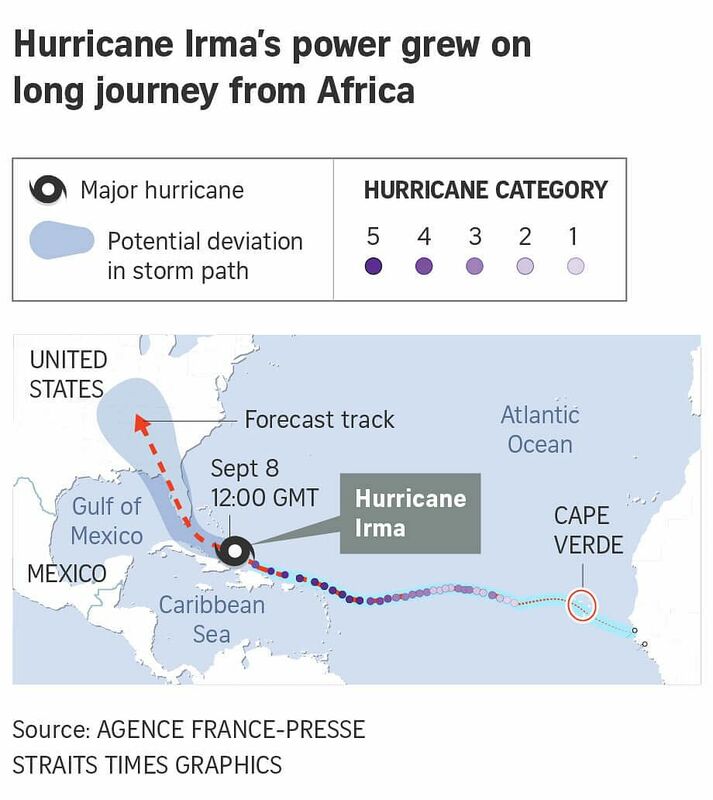 On Friday (Sept 8), the National Hurricane Centre downgraded Irma slightly to a Category 4 storm as it neared Cuba, with maximum sustained winds of 250kmh. By Sunday, it had weakened as it passed through Florida but meteorologists said that it still posed extremely grave risks. For comparison, Hurricane Andrew, which made landfall in South Florida as a Category 5 storm in 1992 after quickly intensifying near the Bahamas, was a relatively compact storm, with hurricane-force winds extending 40km from its centre. It killed 65 people, destroyed 63,000 homes and brought US$26.5 billion (S$36 billion) in economic losses. Irma is expected to affect a much broader swath of Florida, and its sheer size means it could potentially create a much larger storm surge along the coast, pushing water inland and causing severe flooding. Central and South Florida have grown at a rapid pace since Andrew, putting more people and property in harm's way. "It's flawed to use Andrew as an analogue," said J. Marshall Shepherd, director of the atmospheric sciences programme at the University of Georgia. "You have to look at both the magnitude of the storm and the size. Everything we're seeing indicates that Irma will be extremely dangerous." As for climate change, scientists say they are still working to tease out exactly what role warmer temperatures are playing in recent hurricane activity. According to research meteorologist Thomas Knutson from the National Oceanic and Atmospheric Administration, current climate models suggest that a rise in global temperatures could potentially lead to fewer hurricanes in the Atlantic basin, but those that do form would be more intense, thanks to warmer water near the ocean surface, and bring heavier rainfall because of increased moisture in the air. But, to date, it has been difficult to detect clear trends against a background of natural variability. Ocean temperatures are certainly rising because of global warming. But over the past century, the Atlantic Ocean has also gone through periods of relatively little hurricane activity, as in the 1960s and 1970s, as well as periods of high activity, as occurred after 1995. Researchers suspect those cycles are linked to fluctuations in wind shear, which can be affected by events like El Nino, as well as by ocean events like the Atlantic Multidecadal Oscillation, a cycle of fluctuations in sea surface temperature that may be affected by ocean currents and possibly air pollution. "But even if we can't detect it yet, the models indicate that there should be some effect there," Knutson said.